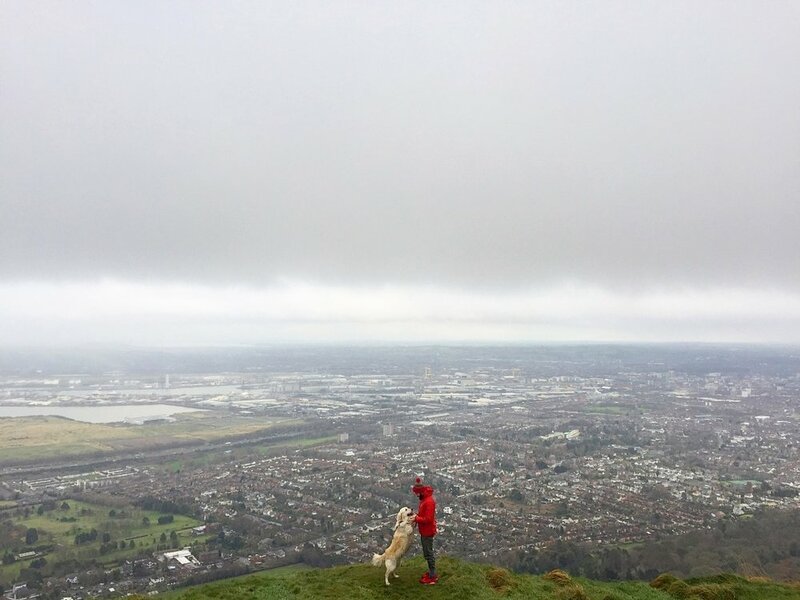 Whether you’ve been a dozen times or yet to go, Belfast’s Cave Hill never disappoints. A straightforward route to stretch the legs with great views to clear the head - and not toooo much effort getting there. Sitting at 368m high, the ‘hill’ is less than half the height of Northern Ireland’s tallest mountain, Slieve Donard. But with the flat landscape right below, you’ll get panoramic views all the way from greater Belfast, right across the city, out towards Holywood and Bangor. On a clear day (unlike this day) you’ll easily see the peaks of the Mournes Mountains 40 miles away. Finding Cave Hill is easy - 5 miles north of Belfast (about 15 minutes drive from the city). The real question is, do you want to tackle the uphill section first, or leave it until after the easy part? Though there are lots of different routes through the forest, the easiest way to navigate them is imagine the view of the hill from Belfast Lough. Then draw a circle in your "mind’s eye. At the bottom of the circle is Belfast Castle. At the top is McArt’s Fort, commanding views out over the city (with green fields stretching back inland around 15 miles to Lough Neagh. So, if you fancy tackling the tiring part first, start off at the Castle and either head up clockwise (via the path at the car park) or anti-cockwise (via the path just out the other side of the Castle). If you fancy starting off with a gentle stroll (which gets you to McArts Fort and the views sooner) then drive to the car park on the Upper Hightown Road and head off from there. Again, the trails from this upper point are just as simple to follow. …to the Castle…then back up the hill the other side (so the left hand side of that circled diagram above), completing the circular walk. Note! To get back to the upper car park, remember to turn LEFT after the zig-zagging steps back up. Otherwise, if you take the right instead, you’ll end up back on the path to McArt’s Fort! Overall you’ll have walked about 4 miles. Whichever path you decided to follow, you’ll have felt the legs burn as the terrain goes from flat, to easy incline, to decline, to steep-ish steps up! Give yourself a good 2-3 hours if you’re worried about your fitness. In a few of the pics above, it might look like we’re close to the edge - but in fact the land slopes gently just below us. However, at McArt’s Fort, be extremely careful especially if you’ve got children or dogs with you. The cliff edge does not have a barrier to protect you from the fall - and there have been serious accidents over the years. You’ll need to keep your dog on the lead the whole time anyway - as you’ll pass through farming fields with animals.